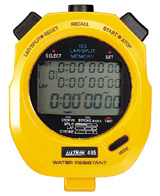 The Ultrak 495, available in a handsome yellow case, is our most popular stopwatch model within the swim coaches' community. Coaches appreciate the Ultrak 495’s crisp button action and common-sense functionality – no automatic split release/no segregated memory equates to a simple-to-use but extremely powerful and precise timing instrument. Other watches may look similar, but only the Ultrak 495 gives the serious swim coach the best combination of quality, usability and value! Only the 495 allows users to take splits while in recall mode!